Why Was Ralph Cairns Assassinated? 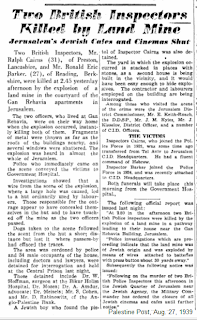 On Saturday, August 26, 1939, an Irgun mine exploded under Ralph Cairns, Head of the Jewish Section of the Palestine Police Force. His companion on the walk home, Ronald Barker, was also killed. 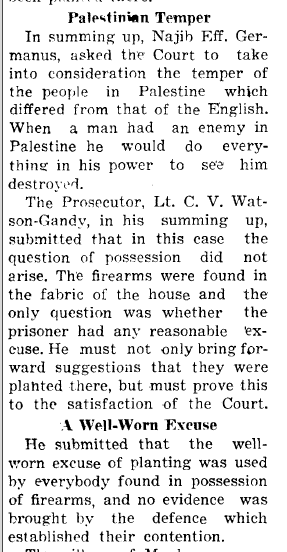 Exactly what did Cairns do that the Irgun decided to assassinate him (his headstone)? Well, Zev Golan notes that Cairns was widely accused of using torture against members of Irgun, including Irgun leaders Benjamin Zaroni and Mordechai Pacho. See here, Case 18. But if you look at the Hebrew book, Megillat Menachem (Scrolls of Menachem), 2008, starting on page 114, you can read what he did to Professor (eventually) Menachem Lewin in June 1939. He offered him water in a cup, brought it to his lips and then withdrew, numerous times. He was slapped repeatedly in the face. Anti-Semitic abuse was hurled at him and degrading words shouted. He was then, after refusing to talk, struck multiple times with fists, on his back, in his kidneys and stomach. The next morning he was removed from the holding cell, kicked and beaten and then laid on a table and his soles were burned with cigarettes. The burn marks remained with him until he died, 60 years later. On the third day, again he was taken to the torture room. Water was dripped on to his head in additional to the normal beatings. He was denied water and tried to lick the drops off his face. They then placed wooden sticks between his fingers and toes and squeezed. Then they crushed his testicles. He fainted from the pain. On the fourth day, he was dressed in civvies and brought before Cairns who asked how he was feeling. Levin replied, "I feel excellent, Your men dealt with me in the most capable methods of torture." Cairns replied, "I am sure that they treated you according to the rules of curtesy and nicety as a you are a gentleman." Lewin refused to answer, was taken to the torture room and whipped on the soles of his feet, the Turkish falaka. He, of course, fainted during most of the applications of pain and this went on for six full days altogther. Cairns threatened to kill him and Levin replied, "Mr. Cairns, I really don't know which of us will outlive the other." He was then lead of to solitary confinement. Two weeks later, he was brought out to see Dr. Judah Magnes who had brought along AD Goitein. Lewin told him and showed him all that had happend, including his many wounds, some still open. 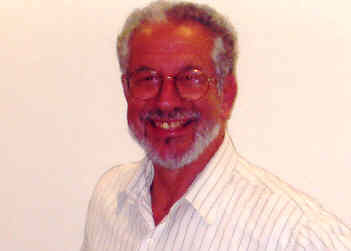 Magnes came a week later with another lawyer, Asher Levitsky. Lewin recalls, p. 137, that when he heard the blast on August 26, he was sure Cairns was the target. After personally torturing Binyamin Zaroni, a member of the Irun's High Command, his fate was sealed. Is Chuck Hagel dumb or dumbest? ...as regards Palestine, there were really three questions. The first was that there should be a national home for the Jews. Upon that they were all agreed. The second point was the safeguarding of the rights of non-Jewish communities. That again, he thought, offered no insuperable difficulties. 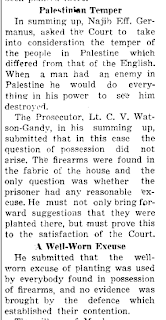 The third was the question of existing traditional rights of non-Jewish bodies, and on that he would like to offer certain observations...He himself had no objection to the mandate which he understood Great Britain desired to exercise in Palestine...[and] had not contemplated that this mandate should carry with it the renunciation of the traditional rights of the inhabitants of Palestine. What was the question before the Supreme Council that after noon? He understood that in undertaking a mandate for Palestine Great Britain undertook, first, to establish a national home for the Jews in that country, and also not to neglect the traditional rights of the habitants generally. From the protocol of the San Remo Conference. A soccer team owner’s plans to recruit two Muslim players have triggered intense protests. That was in the NYTimes. On the web site, front and center. With a pic. How many is "some" vs. the Mayor of Jlm. the team management, most of the fans, etc. who have come out against this behavior? Israel has increasingly isolated itself from the world with its hard-line policies on West Bank settlements, the Gaza embargo and other issues. This week, it unwisely set itself further apart with a decision to withhold cooperation from a United Nations Human Rights Council review of its human rights practices. If this paper, or any rational person, still considers the UNHRC objective, untained, impartial, considerate, reasonable, unbiased or somehow otherwise actually concerned with human rights and not an Israel-bashing forum whose members have ten times more problems with human rights than Israel while ignoring the human rights fiascos in other places much worse, not to admit all the complaints against Israel are true, I stress, then the readership of the NYT as well as its editors is to be pitied. By the way, the UN Humand Rights Coordinator rep in Jerusalem has not yet replied or acknowledged my appeal. Well, we don't accept "buts" anymore. but there is no "same scrutiny"! Any new governing coalition that emerges from Israel’s recent elections should realize that there’s a cost to standing apart. "Standing apart" is normative Jewishness. The anti-Semites stand us apart. Media bias stands us apart. Our uniqueness stands us apart. Our history and our achievements stand us apart. lo, it is a people that shall dwell alone, and shall not take the nations into consideration (my translation). It would be better if the nations treated us better, understood us better, aided us more. But at the fundamental level, we have to take that into consideration. The report on "settlements" is out. Sudan was elected as VP of a UN human rights body (ECOSOC) a couple days ago. It is simply absurd the NYT would publish that editorial. Today, the Times takes another angle to use international law as a cudgel with which to beat Israel, an editorial, titled Israel Ducks on Human Rights. Yisrael Medad and Daled Amos both identify the contradiction at the heart of the editorial. In May, Israel said it planned to stop participating because the council was a “political tool” for those who wanted to “bash and demonize” Israel. The council, whose 47 members are elected by the United Nations General Assembly, is clearly not without faults. More than half of the resolutions passed by the council since it started work in 2006 have focused on Israel and its treatment of Palestinians, and Israel is the only country that is a standing item on the agenda for the council’s biannual meetings. But two paragraphs later, the editors tells that "universal standards" in human rights are important! Human rights reviews are an important tool for judging all countries by universal standards and nudging them to make positive changes. By opting out, Israel shows not only an unwillingness to undergo the same scrutiny as all other countries, but it deprives itself of an opportunity to defend against abuse charges. The decision could also undermine the entire review process by providing an excuse for states with terrible human rights records — like North Korea, Iran and Zimbabwe — to withdraw as well. It certainly will make it harder for Washington to argue for reviews when an ally rejects the process. It would be one thing for the New York Times to acknowledge that the Human Rights Council is flawed and that Israel should submit to its authority, if the flaws were not relevant to Israel's standing. But one of the flaws that the Times itself acknowledged is the council's obsession with Israel, meaning that Israel will not be judged by the "universal standards" it claims to champion. Security guarantees will be a central part of any Israeli-Palestinian Peace Agreement, especially for Israel. This should be addressed at the front end of a new peace process negotiation framework. Israel will require this assurance as borders and settlements are negotiated. The issue of Jewish communities is to be negotiated. The UN Is Seriously Concerned. Seriously. The United Nations Humanitarian Coordinator is seriously concerned by the increased casualties resulting from the use of live ammunition by Israeli forces in the occupied West Bank. Eight Palestinian civilians, including three minors and one woman, have been killed since mid-November in separate incidents in the West Bank. Given the rise in violence directed at Jewish residents in Judea and Samaria, just yesterday a 17-year old teenager was stabbed at Tapuah Junction and additional data can be found at the blog posts below, can I ask if the Coordinator has issued a similar parallel statement regarding this recently? Do you think Israel's Foreign Ministry is concerend? 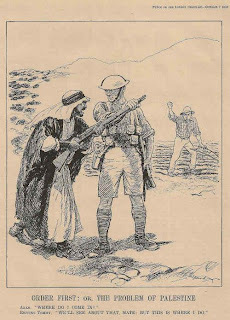 Palestine: How Bad, & Good, Was British Rule? is Avishai Margalit's review of the book of Hadara Levy, Out of Palestine: The Making of Modern Israel , which is an oral history work published 13 months ago. I'll deal with but a few of the themes and charges (the NYRB has the King David hotel as an illustrative photo). 1. "The British made Jerusalem the capital city of Palestine;"
That could have better been written so: "the British made Jerusalem their administrative capital". For the Jews, it always was. For the Arabs, not so. 2. 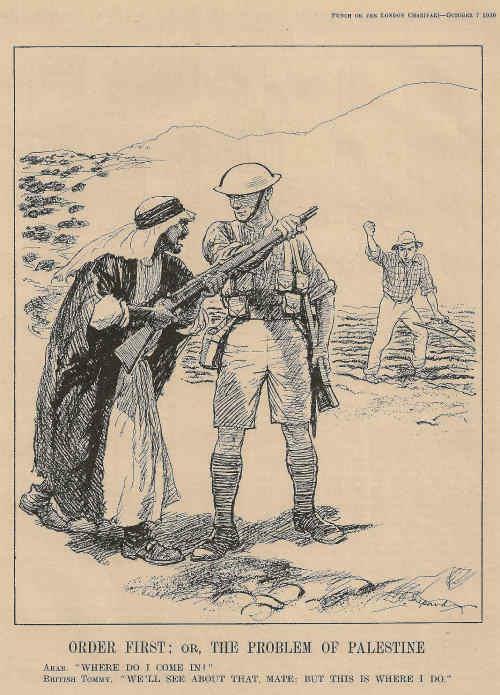 "...a mandate conferred on Britain by the League of Nations...to prepare the country to be a 'national home for the Jews,' without 'impairing the civil and religious rights of the indigenous Arab people.' 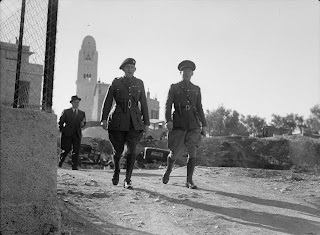 This contradictory task is at the heart of the story of the British Mandate." The Mandate decision does not include the phrase "indigenous Arab people". This is the phrase that appears: "nothing should be done which might prejudice the civil and religious rights of existing non-Jewish communities in Palestine". There is nothing contradictory in this task. 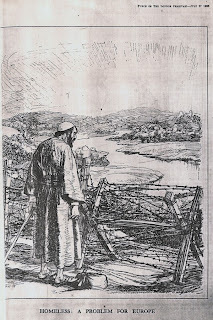 After all, the basis and raison d'etre of the Mandate was "the establishment in Palestine of a national home for the Jewish people...[and] recognition has thereby been given to the historical connection of the Jewish people with Palestine and to the grounds for reconstituting their national home in that country;" That was the primary and overriding purpose. No Arab or any other ethnic group had preference over or even equal to the Jews. 3. "On May 15, 1948, the British soldiers evacuated their barracks and went home. Jews and Arabs in Palestine were left to their own devices"
Absolutely. There were no "Palestinians" in the sense of Arabs only. 4. "The southern wing of the [King David] hotel was rented by the British to accommodate the chief secretariat of the British Mandate Administration. 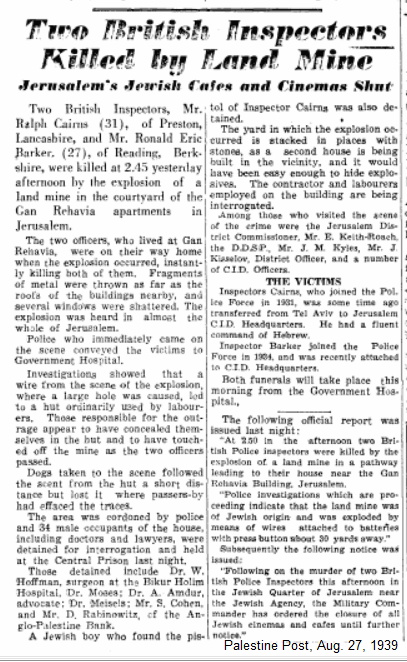 On July 22, 1946, the Irgun paramilitary group, headed by Menachem Begin, blew up the southwestern corner of the hotel..."
He ignores the fact that it was also the HQ of the British Army Command in the Mandate. So, it was a legitimate military target. 5. 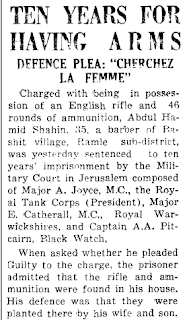 "Baron Martin Charteris, who was the head of British Military Intelligence in Palestine between 1945 and 1946, tells Lazar: “The Jews were united in their passion to return to Palestine, something pushed them there.” But at the same time, he acknowledges: “In a certain way the Arabs belonged there more than the Jews. 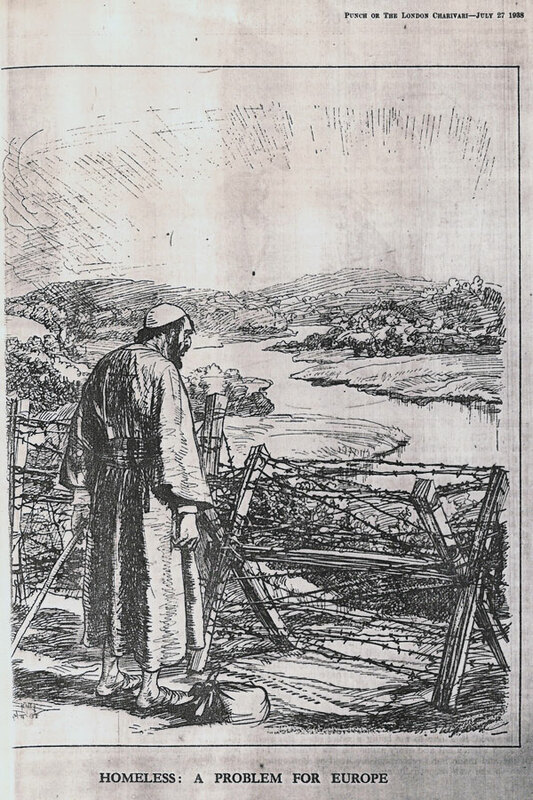 Most of the Jews came from outside, not so?” When Charteris tries to account for what that “something” was that pushed the Jews to Israel, he finds that it was the “romantic element” of the Zionist idea. 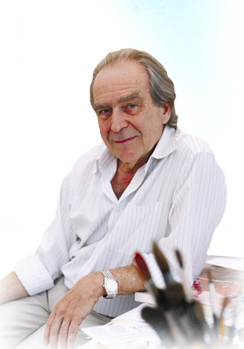 “The Arabs, too, are a romantic people,” he says." That is immensely important as a confirmation of why the underground war for liberation from British rule was just, correct and necessary. 6. "The Zionists’ yearning for homecoming was to a place where they believed Jews had once led authentic, independent, and pristine lives,"
7. "This intense [Arab] intimacy with the pre-1948 landscape of Palestine resonates strongly with the Jewish natives of pre-1948—the landscape Canaanites, if you will—..."
So, we're back to the empty false "Canaanite" narrative. 8. "In her book The Future of Nostalgia, Svetlana Boym draws a useful distinction between “restorative” nostalgia and “reflective” nostalgia.3 Restorative nostalgia concentrates on the nostos—returning to the lost home; while reflective nostalgia concentrates on the algos—the longing and the sense of loss. Zionist nostalgia transformed the Jewish nostalgia derived from religion and exile from the reflective to the restorative..."
I can accept that for it proves the worthiness of Jewish intention. 9. 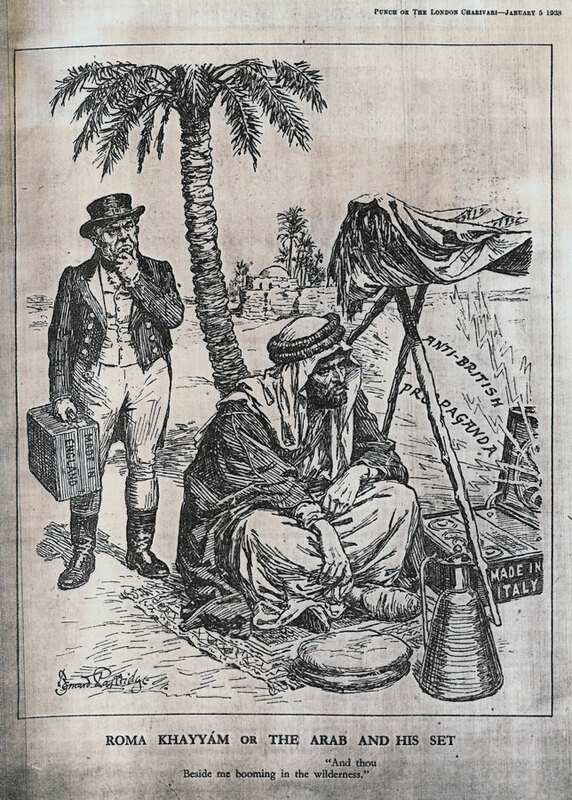 "[Sir Harold] Beeley...says that Bevin had a plan to establish one state in Palestine with an assured Arab majority but he couldn’t find supporters for his plan among the Palestinian leadership. One reason, according to Beeley, was the Palestinians’ belief that they had a good chance of winning a military fight against the Jews over Palestine. Why compromise? Bevin’s plan was the Palestinians’ best shot—and they botched it. 10. "...after the war of 1973...a terrible ugliness of Israeli colonial rule was born...one of the main reasons behind the change was that Israeli settlements were built in the West Bank and Gaza. 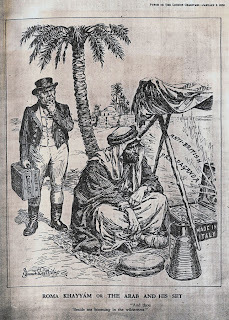 British colonial rule in Palestine never threatened to displace the indigenous population and to disinherit it (though it did infamously prohibit Europe’s displaced Jews from entering Palestine). But Israeli colonial rule did threaten and disinherit the Palestinians, and continues to do so." Not true. In the first place, Arabs viewed, and still do, all Jewish communities - whether pre-state 'colonies' or 1948-1967 Israel, as "settlements", foreign and unacceptable. Secondly, Jewish communities were first established in 1967, in Judea, in the Golan and in Jerusalem's newer neighborhoods. Question: Who said that Jews are descended from apes and pigs? g. Sheikh Ibrahim Madhi, PA official and imam of the Sheikh Ijlin mosque in Gaza City. Answer: All of the above except for D.
7) This election is a reminder that settlers only represent 4 percent of the Israeli population. About one third of the incoming Knesset’s members are religiously observant, though they have varying world views. Alongside 11 members of Shas and seven members of United Torah Judaism, 11 members of Habayit Hayehudi belong to the religious Zionist movement, as do six Likud MKs. Three of Yesh Atid’s MKs live observant lifestyles, as does Hatnuah MK Elazar Stern. Twelve members of the 19th Knesset (10%) live beyond the Green Line, as opposed to 4% of the country’s population. But more than that, can we not assume that all of Likud/Yisrael Beiteinu support Jewish communities in Yesha? Most, at least, of Shas? And of United Torah/Aguda? What does Goldberg mean be "only"? Population representation is one thing. True. If he refers to the Knesset elections, obviously parliamentary representation is the subject. He mixes apples and pears. Betar (or Beitar as they spell it) Football Club has problems with its fans and its policy to avoid signing Muslims. That is a regrettable situation, totally in opposition to Ze'ev Jabotinsky's political philosophy. But one thing did jump out at me, in another sense. The team's management tried to avoid any violence today by having the game against the Um El-Fahm team played without a crowd. But they withdrew when Um El-Fahm claimed financial loss. So, an attempt to prevent violence by total separation is rejected. And every liberal is happy. There will be 550 police on hand, however. So why are Jews banned from displaying any overt indications of Jewishness from prayer, to swaying to lip-moving on the Temple Mount? Why is separation fine and dandy there, usually justified by preventing violence? And why can't the police mobilize for a prayer event a similar number of policemen as it does for a soccer game? I should be there Thursday morning, and I hope to look out for him. Al-Aqsa Foundation for Waqf and Heritage warned of the escalation of the Israeli practices against Al-Aqsa Mosque, and called on the Islamic nation to take the initiative and defend the sanctity of Al-Aqsa. One of the worshipers in Al-Aqsa Mosque told Al Aqsa Foundation that about 100 female soldiers broke into Al-Aqsa Mosque on Monday in their military uniforms. Eyewitnesses reported that, during the tour, the groups of soldiersorganized what looks like a military procession. Meanwhile, nearly 30 settlers, accompanied by a rabbi, stormed Al-Aqsa Mosque yesterday and performed some Talmudic rituals there. Al-Aqsa Foundation said in a statement issued on Tuesday that monitoring the raids carried out by the occupation soldiers and the settlers clearly shows the escalation in the size and form of these raids. It called on the Jerusalemites and the Palestinians from the occupied territories to flock to Al-Aqsa Mosque, and demanded the Islamic nation to take urgent action to support and defend the Mosque against all threats. In order to sort out which interpretations of international law have been created out of whole cloth to apply only to Israel (sui generis) and which are actual international law, it is useful to look up scholarly research on international law between 1949 - when the Fourth Geneva Convention was written - and 1967. The principle that enemy territory occupied by a belligerent in course of war remains the territory of the state against which the war is directed, can apply only as long as this community still exists as a state within the meaning of international law. This is hardly the case if, after occupation of the whole territory of an enemy state, its armed forces are completely defeated to that no further resistance is possible and its national government is abolished by the victorious state. Then the vanquished community is deprived of one of the essential elements of a state in the sense of international law: an effective and independent government, and hence has lost its character as a state. If the territory is not to be considered a stateless territory, it must be considered to be under the sovereignty of the occupant belligerent, which—in such a case—ceases to be restricted by the rules concerning belligerent occupation. This was the case with the territory of the German Reich occupied in the Second World War after the complete defeat and surrender of its armed forces. In view of the fact that the last national government of the German Reich was abolished, it may be assumed that this state ceased to exist as a subject of international law. If a belligerent state ceases legally to exist as an effect of the defeat, as, e.g., the Austro-Hungarian Monarchy in the First World War, or the German Reich in the Second World War, no peace treaty or any other treaty can be concluded with this state for the purpose of transferring the territory concerned, or parts of it, to the victorious or any other state. On the territory of the abolished state a new state or some new states may be established. This was the case with the territory of the defeated Austro-Hungarian Monarchy, which was the territory of two united states. On this territory the Czechoslovakian and the Austrian Republics, and part of Poland have been established. This is also the case with the territory of the German Reich on which two new states came into existence; the western German state, called the Federal Republic of Germany; and the eastern German State, called the German Democrat. Republic. But the new state or the new states, which have not been at war with the victorious state, cannot conclude a peace treaty and are not entitled to dispose of other territory but their own. That the Austrian Republic was forced to conclude a peace treaty with the Allied and Associated Powers, although this new state was not at war with the states which by their victory brought the Austro-Hungarian Monarchy to dismemberment, and that the Austrian Republic was forced to dispose in this treaty of territory of the disappeared state which never was territory of the Austrian Republic, was based on the fiction that the Austrian Republic was identical with the Austrian Monarchy. In the case of the German Reich, the governments of the occupant powers maintained the fiction; that it continued to exist even after the abolishment of its last national government, and on the basis of this fiction it was assumed that the territory of the German Reich occupied by the four victorious powers was not under their sovereignty, but remained under the sovereignty of the German Reich. But the administration of the occupied territory was in no way in conformity with the rules concerning belligerent occupation. It sounds like Kelsen is arguing that Israel wouldn't have had any legal obligation to follow the Geneva Conventions laws of occupation in the territories. They were not considered Jordanian or Egyptian territory and they certainly weren't "Palestinian". To apply the humanitarian components of Geneva is proper, of course, and Israel voluntarily did so. But this sounds to me that even if you hold that the prohibition of "transfer" of a population to the territory includes voluntary relocation, that this would not apply to the West Bank or Gaza after 1967. So would modern legal scholars say that Kelsen was wrong in 1952? Or is he only wrong retroactively, now that the rules were re-interpreted to damn Israel? I emailed this question to a couple of well-known international law experts. One said that there was no clear rule before 1967 about the occupation or conquest of non-sovereign territory, and the rules that are bandied about today are clearly applied uniquely for Israel. The other stated that before 1967 it was "blindingly obvious" that the laws of belligerent occupation would not apply to non-sovereign territory, "exactly the opposite of what everyone says about Israel today." Who says international law doesn't change? What used to be OK is now forbidden - because Israel is considered guilty at the outset. 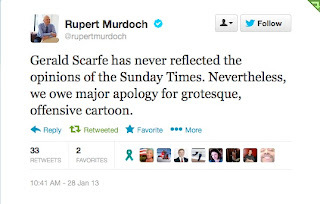 One aspect of that Scarfe cartoon has so far, I think, escaped comment. ...frequent emphasis on children, especially at the Passover seder...the Bible and the Midrash emphasize that the Egyptians singled out the Jewish children for persecution. Pharaoh instructs the midwives to kill all male children. The Egyptian strategy was to disrupt Jewish family life and prevent the birth of Jewish children. And, even when Pharaoh (Exodus 10:10) finally agreed to allow the Israelites to worship for three days, he would not allow the children to accompany the adults. That Jews could be portrayed as placing Arabs, adults and children, into a wall being built when that wall is intended to bring Jews security from Arab terrorism, especially suicide-bombers who destroy themselves in their hatred, is to be so upside-down and backwards a reality that it boggles the minds of all humanists, of which the caricaturist is not. 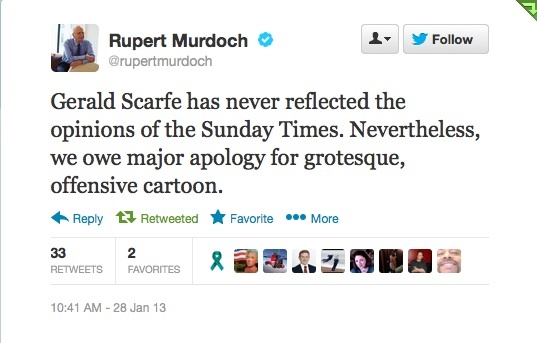 Nor his editor. With thanks to Rav Amnon Chedri. Rav Yochanan said: from the blows that they were struck, their smell became foul. Resh Lakish said: from those [children] that they had sunk into the building, they died and their smell became foul. Such was the Egyptian oppression the most difficult in the world before the Holy One that He said 'oh how I have seen the poorness of my People'. And what can be learned from this, that the verb 'to see' is said twice [for emphasis]? That they [the Egyptians] would dunk the children into the river and then insert them under pressure into the building. A comment I left at Salon. If you were an anti-Semite dedicated to spreading your hatred of Jews, what charges exactly would you make in 21st century America? You would avoid the blood libel—too medieval to write of sacrificing Christian children to make Passover matzo. That kind of stuff circulates in Arab lands or Pakistan, but won’t sell in suburban America. The New York Times' favorite Israeli author, Amos Oz (or is he David Grossman? or, perhaps, AB Yehoshua? no difference, actually, as they are all Leftist and belong to the exclusive "Admor Clique" of Israel 'peace camp', a religiously messianic sect), sat down with Roger Cohen, another type of "favorite" of the NYTimes). “Most Israelis,” he suggested, “would wave goodbye to the West Bank but they don’t want to be suckers, they don’t want the Gaza scenario to repeat itself. Absolutely as for the second part; not so true of the first. Academic-sponsored polls indicate supporters of Judea & Samaria retention, and for sure in major swaths of territories, is above 50% (even this last Knesset vote proved that). And as for being suckers, Oz is the epitome. Hamas continues - just this week again - to deny Israel at all: as a state, the Jews as a national community, our right to any land anywhere in Eretz-Yisrael. Abbas won't and can't and doesn't want to commit to any negotiation result. Pal. 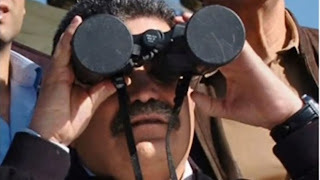 Authority incitement continues, low-level violence continues, Syria breaks up, chemical weapons may move, Iran provides Hezbollah, Iran continues going nuclear, Obama appoints less-then-enthusiastic supporters of Israel to crucial cabinet posts and Oz and Cohen play around in cloud-cuckoo-land. Oh, and when do right-of-center and even national camp representatives get interviewed, with or without coffee or lunch by a NYTimes columnist? Where's your liberal pluralism ideology? Fairness? Freedom of expression? First and foremost, these elections were about internal affairs, the middle class, state and synagogue, the draft, with a silent consensus that the occupied territories do not matter that much. Israelis are no longer interested. True, yes, but now we have Syrian chemical weapons to worry about. Iran goes for space. This was a temporary aberration just because Israelis accept the reality in Judea and Samaria, not because they oppose. Not in the Middle East. Not that Arabs aren't human. They are, but devilishly so, for the most part. And add to that their Islamist ideology, and the weakness of their own "intellectuals" as opposed to Oz-Grossman-Yehoshua, well, there is all the diffrrence. For sure we very well knew and know we are not alone and that's why the security aspect of our presence in Judea and Samaria is a crucial aspect of our support but the idea of a Jew settling in the Land of Israel is the basis for our state. Without that, Oz's parent wouldn't have come - and when they did there was no Green Line. And what of Hamas? “At least what we can do is solve the conflict with the Palestine Liberation Organization and reduce the Israeli-Palestinian conflict to an Israel-Gaza conflict. This will be a big step forward. Then we will see. Hamas may change as the P.L.O. did. Well, at least, Oz finally has come to our aid. Even if that is his final line, it'll be enough. The Arabs won't accept it. Well, since I think we'd all prefer to be a tree, those stones are laughing at Oz's thinking and logic. who can do/say no wrong. That's what they're called here in Israel. My comment at the NYT piece is here. The 'bloody wall of peace' cartoonist. I’ve never had any political, touch wood, interference at all. Do non-Jews use the phrase "touch wood"? Arab: "Where do I come in!" British Tommy: "We'll see about that, mate; but this is where I do." Only 269 NIS at Adika. CAIRO, (PIC, January 28, 2013) – Hamas movement renewed on Sunday its rejection of the two-state solution, affirming its refusal to recognize the “Zionist entity”. Hamas said in a press release that its acceptance of establishing a Palestinian state on 1967 land did not mean forsaking historical Palestine or recognizing legitimacy of the occupation on the remaining land of Palestine. establishing the independent Palestinian state with Jerusalem as its capital. Two Palestinians who were detained on Saturday in the Hawara area near Nablus were carrying three makeshift grenades and three Molotov cocktails. The terrorists managed to hurl two additional firebombs at an IDF post before being apprehended by soldiers from the Lavi Battalion...While searching the terrorists, the IDF soldiers found a letter saying, "The al-Aqsa Martyrs' Brigades claim full responsibility for the bombing at the Elon Moreh settlement. Arab terrorists threw rocks on a bus traveling in the Binyamin region Sunday evening. There were no injuries reported. The incident was mistakenly reported as a shooting attack at first. The number 172 bus, traveling from Jerusalem to the town of Anatot, was hit by rocks at as it passed near the Arab town of Hizme, north of Jerusalem. The bus was damaged, with several of the rocks piercing the bullet-proof windows. Want to Play Coalition Formation? Mali and ... Jews? Why Not? So Attacking Terror Bases is Legal? Coalition Thoughts: He Demanded What Ministry? How Were the Elections, You Ask? Where'd The Green Line & West Bank Go? How Many Americans in YESHA? Turkey Shows Us What Will Be With "Palestine"
Where Does Avigdor Lieberman Live? Jodi Ruderon and the "Palestinians"
What Has Shiloh To Do With NASA? 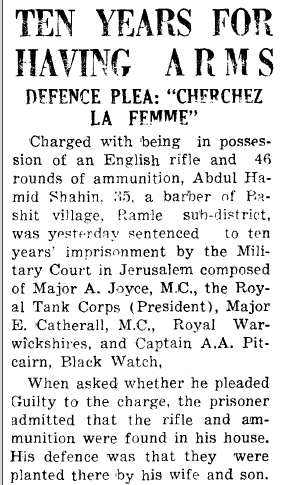 Is Sheikh Jarrah Actually Nob? Where Else Would The Temple Be Built? Didn't Israel Already Turn Right? Does Israel Need US Dole?